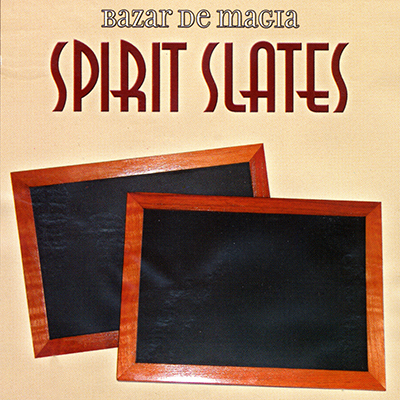 The Spirit Slates have proven to be an extremely popular and versatile prop over the ages for stage performers, mentalists and parlor wizards. These Spirit Slates give you a hands-free, no nonsense method of revealing mysterious writing. The flap lies perfectly flat and is invisible even under the most difficult of performing conditions. Slates may be handed out for close examination of the writing. The performer presents two chalkboard slates and shows them blank on both sides. Placing a small piece of chalk between the wooden slates, he rubber-bands them together. When the slates are reopened, the name of a selected card or writing on a burned billet has magically appeared on the slates. Slates measure approximately 12 inches by 9 inches. Mahogany frames. Made of high quality wood Special permanent paint. Larger for a better view. Perfect fitting flap (fits on any of the four faces). Includes a stick of chalk and instructions.